As we get closer to the launch of the Data, Analytics, and Learning MOOC, one of the ideas we are trying to bring to life is a Visual Syllabus. The instructors expressed concern with the “wall of text” that many learners run smack into when reading a syllabus. That is a very valid concern, so the idea was born to make the syllabus more visual and narrative. Below is the rough draft of the flow of learner tools that will be used in the course. The idea is that learners will be able to click on each area and get an in-browser pop-up with a brief description of each along with a link to start using the tool. I would love to be able to put together an animated gif of this (time permitting). Two quick notes: this is for the learner tools, the tools that the learners will use while learning, as compared to the analytics tools they will be learning about (Tableau, RapidMiner, etc). Secondly, the random pill images are connecting a metaphor that I am thinking about weaving throughout the syllabus (based on choosing the red pill or blue pill in The Matrix; except both represent reality, just one learners are used to and the other that they aren’t). Everything here is subject to change, including the dualistic metaphor. The general idea is that all learners will get a kick off email for the week, setting out the main idea for that week. Learners will then choose to go down the blue path (towards an instructivist path they are accustomed to) or the red path (towards a connectivist path they may not be accustomed to). Those on the blue path will enter the EdX course content to view videos, read text, perform activities, etc. As they encounter issues or concepts they need help with, there will be in-context help buttons to click on to get customized help (but still cooler than that, I am just being vague because this will be new tech that is still being worked on). They will also be put in groups of 3-5 by a new technology to work on specific problem-based learning activities (again, new tech that will be detailed later, but trust me its cool). Some of the course work will be highlighted in daily email updates. Learners can repeat parts as needed or even cross over to the red path at any point they wish. 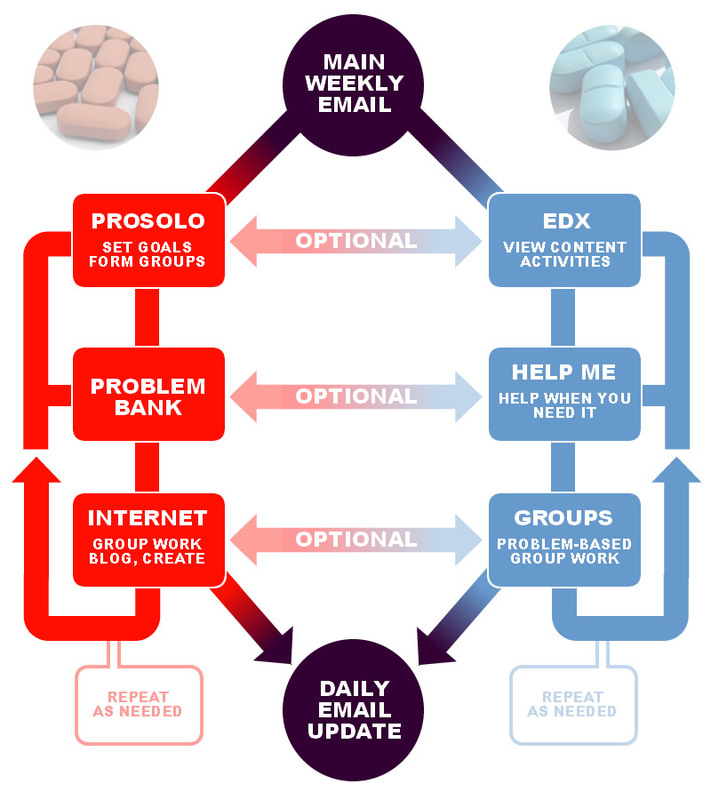 Those on the red path will enter ProSolo (embededd in EdX). This is a new suite of technology that basically enables learners to set their own goals, connect with others that have similar goals, and work to create proof that they have met those goals. If you remember many of the calls to create a tool that fosters true Personal Learning Networks, this is basically that tool. ProSolo will be used in this course and is another cool new thing we are trying. More details on that one to be announced soon. The learners will then go to the Problem Bank (or whatever we name our installation of the ds106 Assignment Bank tool) to find and / or submit problem ideas to work on. They would then connect with their PLN (Internet on the diagram) and work on the problems. Then they would submit artifacts back to the bank. Their blogs, tweets, videos, and other various artifacts will be collected for the daily email updates. Learners can repeat parts as needed or even cross over to the blue path at any point they wish. The learners will repeat, crossover, and work on various activities until the week is over or they are finished and then repeat for the next week. I am a bit surprised at the change of colour coding from blue/yellow to blue/red, but understand it. The videos in #massiveteaching were (almost) consistently color-coded blue/yellow in anticipation. I am excited to see how Prosolo is set up, if it uses badges, and how you will explain it to the students. Finally, I am curious to know how far you got into ethical discussions around the use of those tools, in particular the “form groups” part. Also, when can we expect to be able to download and install Prosolo to play with it? The colors are still kind of up in air, so we’ll see where they end up! Which ethical issues did you have in mind about the group work? ProSolo is going to be a cloud-based solution for the time being. It still has several interface questions to work through, but it will be open for registrations at least by the time the course opens, if not earlier. This is further down, but there are all kinds of ethical problems (according to me) when we encourage students to differentiate themselves (good thing) and act on this in non-transparent ways. In brick-and-mortar world, think admissions at US colleges, where each student writes an essay, but this might weigh more or less depending on your family history (legacies etc). A tool like ProSolo can further down the road face the same abuse, at a micro level. As a graphic facilitator I heartily endorse the idea of striving to create a clear visual to replace the standard “wall of text”. I find the lower arrows on the exterior of the diagram to be a bit confusing. Are you trying to represent the whole system as being iterative in nature? If so, I recommend you soften the boundary between the arrows and the “dead-end” above the arrow. My suggestion would be either to use a gradient and connect the two or blur the edge at the bottom of the “dead-end”. I have participated (both as participant and facilitator/host) in cmoocs and as student in xmoocs. This is a really interesting model. I am looking forward to seeing it in action.